30 Great Home Based Business Ideas in 2018 (For Housewives and Moms). 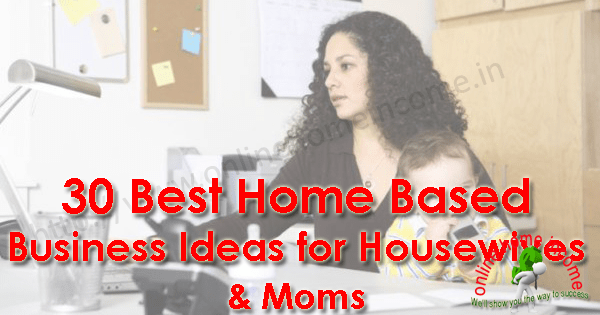 Home based business ideas for housewives and home moms are really a blessing as they can be started easily with low investment and require less time. Moreover, they can spend more time with their family and side by side they can earn their living also. Many housewives and home moms are searching the internet to find some part-time jobs during their spare time. There are lots of resources available, but most of them are a scam and few are good. To those, who are looking for some genuine home based business ideas can use the information shared in this article. Why people search for home based business ideas? The economy is growing higher but not the salary. Many great companies were reducing their staff which in turn increases the number of stay-at-home moms. Unemployment rate increases thus more people searching for some alternative source to make the second income. The development of the Internet and its technology has turned every computer into cash generating machine. Even those great companies were looking for people, housewives to work from home because it is the most cost-effective solution. With the present economic surge, the income alone from the man is not sufficient to sustain the family. Hence, it became important for every housewife and stay-at-home mom has to find some additional source of revenue to support their family. This article is however important to read by every woman to get some knowledge about the various online jobs. There are many ways to earn money if you prepare a mindset of working from home. Let’s spend your next few minutes to read this research article. A Daycare is a care given to a child, toddler (or) preschool kids, by a person other than the child’s parents (or) legal guardians. It’s a type of an ongoing service only for a specific period of time, such as when the parents went for office work. This is one the best home based business ideas for housewives and moms, especially if they love being with children’s and kids. It allows you to earn some additional second income spending time with your own children while taking care of other people children’s as well. This business idea was a good choice for women who are already experienced in handling children. The woman is always creative and likes to do things differently from others. If you are a creative individual and has interest in making artworks, then these home based business ideas are for you. You can start making gift baskets full of distinctive and charm, with artwork and glitters. Create these items from your home and start selling in the local market for money. With proper marketing skill, you can earn a lot of money during festive seasons such as Christmas, Diwali etc. The sales opportunities are endless, as many people are most likely to gift some customized things rather than the common items available at gift shops. This small business from home will earn you a nice additional income if you are an artistic, creative and entrepreneurial. This is one of my favorite online jobs that I recommend to everyone including housewives, college students, and part-time job seekers. If you know internet browsing and have basic computer operating skill, then you can easily start this business from home. There are many websites on the internet where you can register to take up PTC jobs. It is free to join and no special skills required to work. Just create one free account with these genuine lists of PTC sites, log in to your member area and view all available ads in your account. This home business will pay you money for clicking and viewing ads on your computer. You should have PayPal account to get your payments. In the olden days without much electricity feasibility, candles are the only sources of light in most of the houses. Nowadays candles are widely used in birthday parties, marriage functions, get-together occasions and in many more functions. Candles occupy the most integral position and used as a decorative item in most of the functions and occasions. So these kinds of home based business ideas for housewives and moms will surely help to make some additional revenue during their free time in their home. Check the newspaper’s classifieds section to find some reputable candle making franchise providers in your area. They will supply all the raw materials and the machines. Also, you can sell back the finished products to them and make money. Do you have the habit of writing diaries? Do you read novels and stories? Then, why wasting your free time at your home, instead you can start writing a story-book, novel, DIY guide, Tutorial book etc. You can publish your book in digital format [E-book] through Amazon, Kindle etc. If you have your own blog, you can publish for a direct selling. You can spend your leisure time to write some useful information, and compile a book which you can later sell for money. There are E-book authors who are making ton’s of money every day by selling their publications. One book can earn you very often. It takes some time to reach the market, but once done, the income is not in your hands. This is also the best part time business ideas for housewives. Many college going girls and young working women were spending huge money on toning their external appearance. Hence, I am sure this home business will be one of the profitable ones for every woman who planned to start. It needs a specialized beautician training and there are many training institutes available in your area, who conducts some 3-month (or) 6-month course. Join any one of these institutes and get the training with the certificate. Then find a suitable place in your locality and rent a 10 x 10 room. Purchase the required furniture’s and accessories to start this business. Category: Service based business idea. Do you love cooking? Do you enjoy cooking delicious dishes? Are you the only person who cooks for family events and holidays? Then, it’s the time to convert your passion into profits by starting a home-based catering business service. Prepare a menu that you are specialized with and contact your local people asking for a chance to cook for their functions and events. By the days, you can easily grow your business if you are true and passionate about. Who doesn’t like to visit interesting, admiring, adventurous (or) natural places? This is a new concept that creates businesses to people who can provide guiding services. People are traveling every day to many different country (or) city. You can make some good income by providing the best travel guide services to the tourists. You can arrange them a hotel to stay, plan for the places of visiting, and also guide them to find some more interesting places. This is a seasonal business but high income earning opportunity is available. It is a performance-based business model where an individual can earn a decent income by selling other merchant’s products (or) services. This is a nice business ideas for housewives because no products are required to market. No physical store setup needed. Just Google to find some reputed affiliate marketing program and register a free account with them. Find some of the best selling products and promote using various marketing strategies. On every successful sale, you will earn a commission. A computer with Internet connection and a bank account is all that needed to start this home-based part-time business. Some recommended places to start this business was: Amazon, Flipkart, Commission Junction etc. This part-time business is suitable for educated housewives who have completed their master’s degree program (or) have practical administrative experience. You can become a freelance business coach (or) set up a physical office in your area and place a display board about your offer. Your prime duty would be to empower small business owners and managers to improve their performance in their work, personal development, and career growth. If you hesitate to start the home-based catering business, then there is another way to convert your passion into profits. You can prepare the food at your home and sell in the local markets. In Tamilnadu, I can see much small home-made food serving hotels abutting highways and markets. This small business is often good to start and is suitable for any people who are good at cooking. You can get the help from your family business to support your cooking, prepare the food and pack them with aluminium wrappers. Display them in your home (or) sell to the local shops with a small profit margin. The creative knowledge of a woman can be converted into a home business to earn additional money. Many women have the hobby of crafts making, home decor making using plaster of Paris and other items available on the market. This hobby can be converted into a venture and can be run from the home location. This small business does not require any huge investment to begin. There are a lot of different things that can be made by using Plaster of Paris, such as play dolls, lead casting, sculpture with paintings, sand casting etc. You can use chemical colour, water colour, and oil colour to give a better look and design. The final product will be marketed through the local fancy store, specialized dealers, (or) even direct marketing will help you earn money. Online marketing will work better to grab the world market right from the beginning. In countries like India, people often make laddoos, jaggeries, sweets, and snacks in their home on every festive season especially Diwali, Pongal, Christmas etc. Do the people love your laddoos so much? Were your snacks famous in your locality? Then, it’s time to start a home-based business on the side. Make some large quantities of laddoos, jaggeries and other desserts for selling. You can either directly retail your product in your area and tie up with some grocery shops, bakeries, and departmental stores. With proper marketing skill, you can earn decent income every day from the part-time home business. Your specialty turns into money. Category: Product based business idea. The best low investment business idea is cake designing and making. You can start this business in your home kitchen as it doesn’t require many tools, resources, and space. Also, there is no need to go for some training classes (or) any skilled labor for cake making. But you should be extremely good to create your own market, so be little creative to show in your product. Initially, you took some orders from your neighborhood and once you are good at making cakes in high quantity, tie up with local bakeries. You can gradually increase your sales in your area and expand your home business. Women education is being supported by most of the countries in the world, thus increases the job opportunities and skilled labour for every IT companies. But after marriage, many women stop going to 9 – 5-day job because to look after their family. What will cause their education then? You can still find a way to use your academic knowledge by taking home tuition for school students, college students, and part-time studying candidates. Times are changing, and if you think you are sound in your field, then you can choose to teach someone else your knowledge. This part-time home business can earn you a decent second income every month without investment. Initially, you can take home tuition for school students in your locality and then expand your wing. Women are educated and they are even working in software sector industries. If you are tech savvy, then you can start computer repair service business. If you have the knowledge of finding the cause of an issue and can able to fix them on your own, then you are the perfect fit for this small business. You can start from your home by allocating a room dedicated to this work (or) hire a 10 x 10 room in your area to manage this business. The wedding is the auspicious event where two souls unite together. Everyone wants to preserve this one-time memorable event in their lifetime. Women are generally having some organizational skills and also possess talents to work under pressure. You can start a wedding planning consultant service and organize every event in the function like Catering, Reception arrangements, Wedding purchase planning etc. Video coverage, Photo and album making, even sometimes should transportation facilities if the marriage event is planned at a remote place. You can charge some Rs. 50000 per event to manage, organize all marriage events. This is a good small startup business ideas for housewives and stay-at-home moms. It is a perfect business idea for all the individuals who are very passionate about design, artwork and home decoration. Initially, you take an internship (or) work with some establishing companies to gain some practical knowledge. Later you can start this business on your own at your home base. If you are excellent at giving unique creative ideas, you can easily grow this home-based business. The days are gone where people built homes just for shelter’s, but the trend is the home becomes one of the most integral parts of their status in their society. This always increases the demand for internet designing career. This is one of the highest in demand jobs in this era. Interior designing is not only for home but also for commercial purposes such as office, hotels, commercial buildings, malls and restaurants etc. The nineteenth home business idea for the housewives was running a cooking class for college girls and other passionate cooking ladies. It is a pure ladies business where you can convert your passion into money. You can just use your Kitchen (or) create a space at home with cooking facilities to start this home business. This business idea will surely work because many young housewives are showing interest to show uniqueness in their cooking. This is becoming a trend in India and most parts of the world have made this business start up a successful one. Expected profit: 40% or more. Because you will charge some monthly coaching fee where expenses are the purchase of groceries, vegetables, and other cooking items. Then the rest of the fee was your profit. There is always a huge competition between every online business [websites]. The business that ranked first in the search results always gets more sales. SEO is the activity that performed to bring the web page to the first page of the SERP results. If you think you are an expert, then you can start a freelance home-based SEO consulting services. SEO stands for Search Engine Optimization. The websites that appear first will get the most sales and attract the most visitors. So, online businesses should avail a help from some expert SEO professionals to rank their business. This home based business is a creative business with unlimited earning potential based on your knowledge and the results you drove. You can start your own service from your home and all you need is a computer with internet connection, a social profile page, a small blog to list your services and a contact number. The today’s technology has let every small business to open for the international markets through a website (or) a blog. There are huge opportunities available for creative UX / UI web designers on the internet because all businesses are web-based. The best example is Amazon, Flipkart and much more, who don’t have any physical store at different places but they have their market across the country. They made this possible by running a pure web-based business [Ecommerce store]. So you can ask, how can I earn from this business? The Amazon website was built by a web-designer. Maybe you got the point, you can able to earn a huge money in this business. You can start from your home if you have the knowledge and the computer with all required software. This service-based business is a process of giving hospitality in the name of entertainments in some events held by corporate (or) businesses to their staffs, clients etc. This small home business is easy to start, profitable and also really you will enjoy when doing. Some of the events you can arrange our weekend dining party, business conference, and meetings, seminars, birthday celebrations etc. As an event planner, you have to fix the things such as time, actions, and transportation etc. To get started you need to name to your startup, a business card, an online portfolio (blog) and some unique ideas to canvas. Start by organizing events in your area to gain some experience. Later contact the corporate and other established business firms. Jewellery always holds an integral part of human civilization, especially among ladies. Every woman in India and across the world were fond of wearing jewels. Mostly they were during festive seasons and at auspicious occasions such as marriages, parties, meetings and other engagements. Jewels I mean here is not only made of Gold and Platinum, but Gold Plated jewels also give the same feel as a real gold jewel. Comparing to the cost also is lower and hence starting this small business at home is the best choice for housewives. With a little investment, you can buy from some whole seller and stock in your place. Later, you can sell those jewels in your area with some profit on your investment. These home-based business ideas will work for sure and it is one kind of profitable businesses. But it takes some time to establish yourself in your market. Working as a freelancer is another a great way of making money from home. This is a very profitable business for all people including educated housewives and home moms. There are lots of opportunities to work as a freelancer in the fields such as Web Designing, Data Entry, Form Filling, Photography, Content writing etc. I have written an article to explain step by step procedure to register with freelancer website and also wrote how to get one online job from that site. Freelancing is a great source to earn extra income from home and this is best suitable home based business ideas for housewives as far as we concerned. No matter your expertise, you will surely find one work from home job with the freelancer site. There are other sites such as O-desk, Fiverr etc. Blogging is the most popular small business ideas suitable for everyone including housewives, home moms. You can start this business from home, and can easily make some money using your creative ideas. One can start a blog on any subject based on their passion and interest. To start this perfect home based business, you need to register a domain name, purchase a reliable hosting and WordPress. Install the theme, design the blog, start writing the contents on the topic you chosen and then perform SEO activities to drive traffic to your blog. To start making money from the blog, you can use various monetization techniques such as installing Google Adsense, Affiliate Marketing, Selling own products (or) services etc. You can make a good second income in your free time by doing blogging business at home. Category: Skill based requires creativity. A virtual assistant is a person who provides support to other businesses from a remote location. They are self-employed and provide professional, technical and administrative services. They also support the smooth running of businesses managing from their own location. Various services including checking and answering emails, organizing to-do list, maintaining schedules etc. Some important qualifications are good communication skills, time management, resource management and problem-solving abilities. Stay at home moms and housewives are the perfect fit for this home-based businesses. You can earn up to $50 [Rs. 2000] per hour by working from your home. Recommended sites are Livehelpindia, Elance, Craigslist. There are many different types of virtual assistant jobs and some of them are, account assistant, event planning, staffing etc. One of the legitimate home based business ideas for housewives and stay-at-home moms was doing paid online surveys from home at their free time. Surveys are a set of questions asked to gather feedback on a product (or) a service from the people. Many MNC’s are ready to spend billions of dollars for surveying. Survey companies are there to undertake survey programs on behalf of these MNC companies, thus offering a wide range of huge online earning opportunities. There is a huge opportunity to earn from home with paid surveys. Registration is free and acceptable worldwide. The working is very simple, register free and complete your profile surveys. Whenever new survey comes, they will send you an email invitation to participate. Attend the survey and on successful completion, you will be rewarded with cash (or) gift vouchers. A copywriter is a person who writes content for commercial use for business websites and Blogs. If you have the knowledge to write some compelling content on any subject, then these small home business ideas are for you. Some of the highlights are, own working hours, no boss, no time limit and can work for anyone. Set your own rates based on the project you take. Educated housewives and knowledgeable working woman’s can do this business from their home either evening (or) in their free time. Normally you can earn up to $20 [Rs. 1000] per hour you spend to write the content. There are many different types of copywriting jobs available such as ad concepts, online copywriting, social media copywriting, technical writing, SEO writing etc. The best place to start this home-based business was a freelancer, Fiverr, O-desk etc. You can Google to find some other websites in your area. In this running world of technology, people don’t have time to look after their health. They eat anything that comes in front of their eyes when they feel hungry. This causes serious health issues and hence it creates the demand for personal diet instructor. More people are concerned about their food habits to maintain a good health and so home-based freelance diet instructor jobs have become profitable ones. People ready to pay for them and dietician prime duty was to organize an eating schedule for their clients. The last and final recommendation in this list was becoming a professional photographer for online businesses. Every housewife and women have Smartphone’s who fond of taking selfies. Do you know you can transform this passion into profits? Online businesses are looking for professional photos for their website and blog. A perfect home based business ideas for housewives to start with some little skills and passion. There is always a great demand for high-quality pictures, unique photos and many online ad agencies are ready to pay for it. To start this business, you should get some training by attending photography training classes. Then some knowledge of photo editing software (A professional course would be the best). A professional camera, a computer is the required equipment and there are many online websites available to buy your photos. Some recommended sites: Shutterstock, Fotolia are the great sites to sell your photos to earn money. I have written this article to create an awareness about the various home business opportunities for housewives and working women. Present economic situation pushes both husband and wife to go for a job, but at the same time, it creates a bonding gap between them and their children. But, thanks for the technology that brought up tons of earning opportunities to everyone who wishes to make money from home. I have listed some of the best online and offline home based business ideas for housewives and stay-at-home moms. Learn these 30 ideas and think about starting one today. There is an opportunity for all group of people to start a legitimate online business. 1.) Comment me below if you have any queries (or) new ideas that I missed here. 2.) Comment which idea you took today for your home based career jobs.